This calculator helps you determine the scaling potential of the water by using the Langelier Saturation Index. Give the values of your water analysis. All the fields with * are required. LSI<0 Water is undersaturated with respect to calcium carbonate. Undersaturated water has a tendency to remove existing calcium carbonate protective coatings in pipelines and equipment. LSI=0 Water is considered to be neutral. Neither scale-forming nor scale removing. LSI>0 Water is supersaturated with respect to calcium carbonate (CaCO3) and scale forming may occur. The Langelier Saturation Index is based on the study of the carbonate equilibrium in water. The elements that are important for the carbonate equilibrium are gaseous carbon dioxide CO2, aqueous carbon dioxide (CO2)aq, carbonic acid H2CO3, bicarbonate HCO3-, carbonate CO32- and solids containing carbonate like calcium carbonate CaCO3 or magnesium carbonate MgCO3. Below you can see all the equations that matters for the carbonate equilibrium. These are all equilibrium reactions symbolized by double arrows. Figure 1 can give you the filling that you have to start with gaseous CO2 in your water to obtain at the end calcium carbonate CaCO3. This is not the right interpretation. You can have water that naturally contains bicarbonate ions HCO3-. So equilibrium equation (A) may occur without the earlier equilibrium reactions with carbon dioxide. The pH of a solution is usually known. Equations (A), (B) and (C) are used to compute the saturation pH (pHs). Equation (C) is a result of the combination of equations (A) and (B). From this point untill the formula of pHs you only have to use mathematics. If you have a water analysis de calcium and bicarbonate concentration are known so you have to calculate the activity coefficients. These coefficients are approximately equal to one but it is better for the accuracy of pHs to calculate them. This equation is found by adding an exponential trendline in the graph of the solubility product constant as a function of the temperature in degree Celsius. 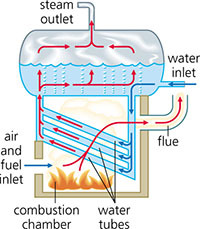 A boiler is a device for generating steam, which consists of two principal parts: the furnace, which provides heat, usually by burning a fuel, and the boiler proper, a device in which the heat changes water into steam. The steam or hot fluid is then recirculated out of the boiler for use in various processes in heating applications. The boiler receives the feed water, which consists of varying proportion of recovered condensed water (return water) and fresh water, which has been purified in varying degrees (make up water). The make-up water is usually natural water either in its raw state, or treated by some process before use. Feed-water composition therefore depends on the quality of the make-up water and the amount of condensate returned to the boiler. The steam, which escapes from the boiler, frequently contains liquid droplets and gases. The water remaining in liquid form at the bottom of the boiler picks up all the foreign matter from the water that was converted to steam. The impurities must be blown down by the discharge of some of the water from the boiler to the drains. The permissible percentage of blown down at a plant is strictly limited by running costs and initial outlay. The tendency is to reduce this percentage to a very small figure. Proper treatment of boiler feed water is an important part of operating and maintaining a boiler system. As steam is produced, dissolved solids become concentrated and form deposits inside the boiler. This leads to poor heat transfer and reduces the efficiency of the boiler. Dissolved gasses such as oxygen and carbon dioxide will react with the metals in the boiler system and lead to boiler corrosion. In order to protect the boiler from these contaminants, they should be controlled or removed, trough external or internal treatment. In the following table you can find a list of the common boiler feed water contaminants, their effect and their possible treatment. Find extra information about the characteristics of boiler feed water. Water smells like rotten eggs: Tastes bad, and is corrosive to most metals. Found mainly in groundwater, and polluted streams. Corrosive, forms carbonic acid in condensate. Filming, neutralizing amines used to prevent condensate line corrosion. Corrosion and pitting of boiler tubes. Pitting of boiler tubes, and turbine blades, failure of steam lines, and fittings etc. Tolerance of approx. 5ppm max. for most applications, 10ppm for potable water. Carryover, foaming, deposits can clog piping, and cause corrosion. Found mostly in surface waters, caused by rotting vegetation, and farm run offs. Organics break down to form organic acids. Results in low of boiler feed-water pH, which then attacks boiler tubes. Includes diatoms, molds, bacterial slimes, iron/manganese bacteria. Suspended particles collect on the surface of the water in the boiler and render difficult the liberation of steam bubbles rising to that surface.. Foaming can also be attributed to waters containing carbonates in solution in which a light flocculent precipitate will be formed on the surface of the water. It is usually traced to an excess of sodium carbonate used in treatment for some other difficulty where animal or vegetable oil finds its way into the boiler. Scale deposits in boiler, inhibits heat transfer, and thermal efficiency. In severe cases can lead to boiler tube burn thru, and failure. Softening, plus internal treatment in boiler. Forms are bicarbonates, sulphates, chlorides, and nitrates, in that order. Some calcium salts are reversibly soluble. Magnesium reacts with carbonates to form compounds of low solubility. Foaming, carbonates form carbonic acid in steam, causes condensate return line, and steam trap corrosion, can cause embrittlement. Deaeration of make-up water and condensate return. Ion exchange; deionization, acid treatment of make-up water. Sodium salts are found in most waters. They are very soluble, and cannot be removed by chemical precipitation. Priming, i.e. uneven delivery of steam from the boiler (belching), carryover of water in steam lowering steam efficiency, can deposit as salts on superheaters and turbine blades. Foaming if present in large amounts. Priming, or the passage of steam from a boiler in "belches", is caused by the concentration sodium carbonate, sodium sulphate, or sodium chloride in solution. Sodium sulphate is found in many waters in the USA, and in waters where calcium or magnesium is precipitated with soda ash. Deposits in boiler, in large amounts can inhibit heat transfer. Most common form is ferrous bicarbonate. Hard scale in boilers and cooling systems: turbine blade deposits. Deionization; lime soda process, hot-lime-zeolite treatment. Silica combines with many elements to produce silicates. Silicates form very tenacious deposits in boiler tubing. Very difficult to remove, often only by flourodic acids. Most critical consideration is volatile carryover to turbine components. Water absorbs more heat for a given temperature rise than any other common inorganic substance. It expands 1600 times as it evaporates to form steam at atmospheric pressure. The steam is capable of carrying large quantities of heat. These unique properties of water make it an ideal raw material for heating and power generating processes. All natural waters contain varying amounts of dissolved and suspended matter and dissolved gases the amount of minerals dissolved in water varies from 30 g/l in sea water to anything from 0.005 to 1500 mg/l in fresh water supplies. Since water impurities cause boiler problems, careful consideration must be given to the quality of the water used for generating steam. The composition of boiler feed water must be such that the impurities in it can be concentrated a reasonable number of times inside the boiler, without exceeding the tolerance limits of the particular boiler design. If the feed water does not meet these requirements it must be pretreated to remove impurities. The impurities need not be completely removed in all cases, however, since chemical treatment inside the boiler can effectively and economically counteract them. Feed-water purity is a matter both of quantity of impurities and nature of impurities: some impurities such as hardness, iron and silica are of more concern, for example, than sodium salts. The purity requirements for any feed-water depend on how much feed water is used as well as what the particular boiler design (pressure, heat transfer rate, etc.) can tolerate. Feed-water purity requirements therefore can vary widely. A low-pressure fire-tube boiler can usually tolerate high feed-water hardness with proper treatment while virtually all impurities must be removed from water used in some modern, high-pressure boilers. Only relatively wide ranges can be given as to maximum levels of alkalis, salt, silica, phosphates etc, in relation to working pressure. The actual maximum levels must be obtained fro the boiler manufacturer, who will base them on the characteristics of the boiler in question. The following tables are extracts of recommended levels from APAVE (Association of electrical and steam unit owners), up to pressures of 100 bar for medium steaming rates and for volumes of water in the chambers sufficient to properly control the blow down rates, and from ABMA (American Boiler Manufacturers Association) in its standard guarantee of steam purity.